Medium is a content platform that features free as well as premium content. It has a unique business model; free members can only read the free content and paid subscribers can read both types of content. Medium doesn’t show any type of advertisement on the platform, all its earning comes from it’s paid subscribers. When you read something on Medium without an account, it shows you constant login/signup interruptions. On top of that, there is a navigation bar at the top and a Get Updates bar at the bottom. Both these bar stick permanently unless you login/signup. These interruptions are annoying and make the Medium very distracting. Thankfully, you can avoid these interruptions. 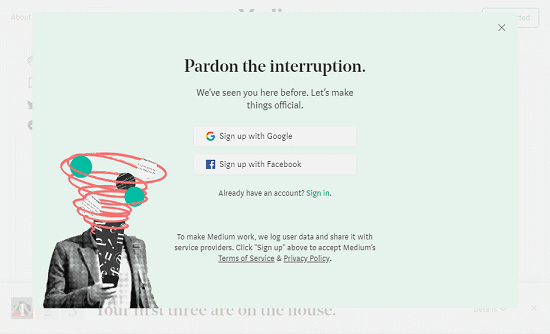 There is an extension for Google Chrome and Mozilla Firefox that lets you overcome the interruptions on Medium. How To Make Medium Distraction Free? 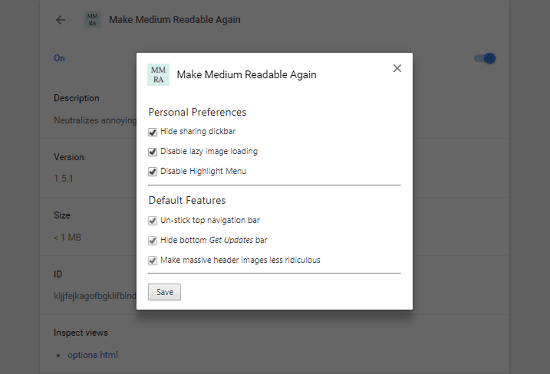 “Make Medium Readable Again“ is an open source extension that can make Medium distraction-free by disabling its interruptions. This extension provides you with two set of features to enable/disable various Medium interruptions. The options to disable major interruptions come under the Default Features. And, the other additional options come under the Optional Features. Despite their names, you can enable/disable any of these options whenever you want. hide top navigation bar and bottom Get Updates bar, shrink massive header image, hide posts meter Upgrade button and “Open in App” button. hide the clap/share bar, disable lazy image loading and popup menu that appears when selecting text. This extension blocks the constant login/signup interruptions. When you read articles on Medium without login, it constantly gives you interruptions to login or signup. With this extension installed, you won’t get that interruption anymore. 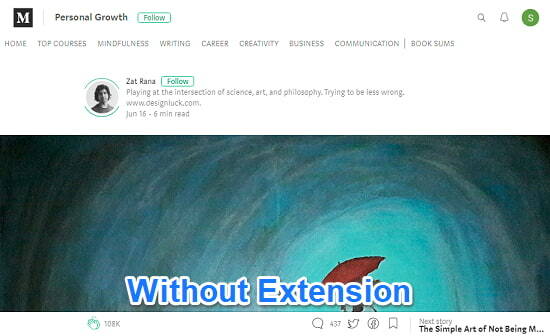 When you read an article on Medium without login, the top navigation bar and bottom Get Update bar stick there permanently. This makes the reading area comparatively small and distracting. Apart from that, there are claps and social media buttons that sit on the left side throughout the article. And, if you want to quickly select a text, there is that annoying highlight menu. 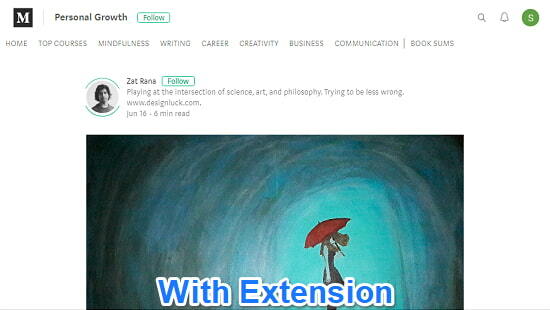 With this extension, you can disable any or all of them. This gives you an immersive reading experience with any distraction. 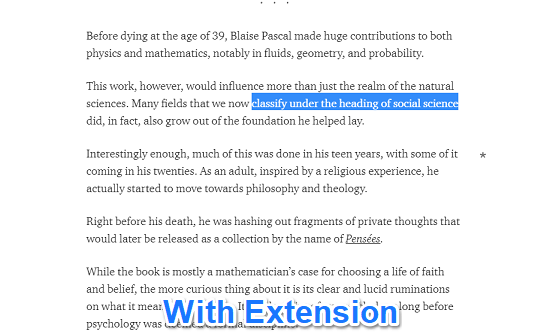 Another Medium feature that you may or may not find annoying is massive header image in the articles. The image starts from one edge of the screen and ends on another edge. And, then there is lazy image loading which loads an image when you reach it. This extension fits the header image right in the article by making it small. It also disables the lazy image loading. Now, all the images will load instantly. Download this extension for Google Chrome here. Download this extension from Mozilla Firefox here. 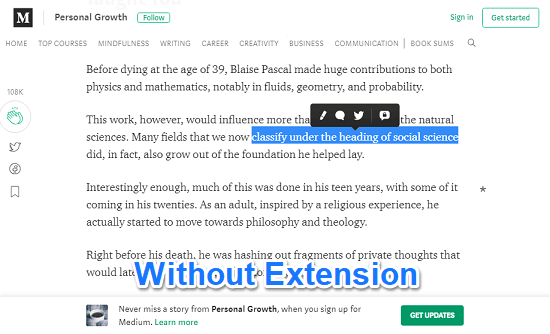 “Make Medium Readable Again“ is a useful browser extension that improves your overall reading experience on Medium. It makes the Medium more readable by disabling the annoying options and distracting interruptions.